JSC "Lukoil" is one of the largest international vertically integrated oil companies with 2.1 % of the world's oil production. The leading positions of the company are the result of twenty years's work on expanding the resource base through increased scale activities and the conclusion of strategic transactions. One of the priorities of the company is to take care of the younger generation and to train young qualified specialists for the Russian oil industry. "LUKOIL" supports a number of institutions of higher education, preparing the specialists of the oil and gas fields, in particular the USTU. 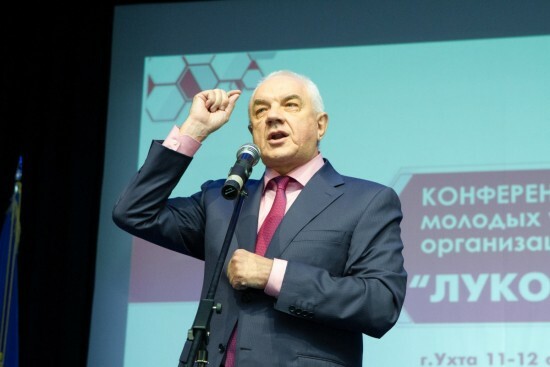 Patron of the USTU on behalf of the JSC "Lukoil" is its branch "Lukoil-Komi". This fruitful cooperation has lasted for more than 10 years already. The Company "Lukoil-Komi" systematically allocated funds for the upgrading of educational and material base of Ukhta University complex, which allows to keep the educational process up-to-date. Also the company manegement team assigns special scholarships to talented students.Thanks to the financial support of the "Lukoil-Komi", University students and young professionals regularly participate at scientific conferences. Excursions to the enterprise's affiliates and also to the Museum of the history of the oil and gas industry are being sponsored by facilities of the company and Lukoil-Komi LLC. Regularly, students and pupils of the Ukhta boarding school for orphans and children remained without parents ' care gain free vouchers to summer camps over the holidays. In turn, the University conducts high-quality training for the company's subsidiaries. Students studying for careers in the oil and gas fields, have the opportunity for work experience internships and Diploma internships in the structural units of the LUKOIL-Komi LLC with further employment. The basis for the development of partnerships between the LUKOIL-Komi and the USTU in part of the training and staff development is a comprehensive program that covers all forms of joint work of the University and the oil company.